Microsoft has announced that it's extending by three months its free upgrade period for people switching from Windows 10 S to Windows 10 Pro. Originally, Microsoft was only offering free upgrades until December 31, 2017, but now you’ll be able to swap Windows 10 S for Windows 10 Pro for free until March 31, 2018. After that date the upgrade cost will be $49 (£39, around AU$60) – unless of course Microsoft decides to extend the free upgrade period again. This will be good news for people who are wary of getting a Windows 10 S device. Windows 10 S is a version of Windows 10 that only allows you to run apps from the Windows Store, and Microsoft claims this helps keep Windows 10 S secure, and prevents it from gradually running more slowly over time as more programs are installed. However, many people are finding that by being limited to Windows Store apps they're not able to run programs they rely on. 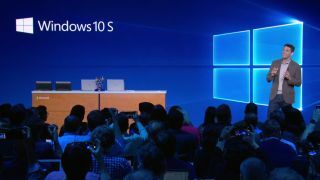 Upgrading from Windows 10 S to Windows 10 Pro will fix that, enabling users to run any Windows program they want – although the upgrade process is irreversible. There are a number of reasons why Microsoft may have done this. Perhaps it saw how many people were upgrading from Windows 10 S to Windows 10 Pro. It may also be worried if Windows 10 S devices are struggling to sell. Or maybe a new range of Windows 10 S devices will be launching soon, and Microsoft wants to make sure that people buying those will have the option to upgrade to Windows 10 Pro for free. No matter what the reasons are, if you were thinking about buying a device with Windows 10 S preinstalled, such as the Surface Laptop, and weren't sure if the Windows Store-only operating system was for you, then you now have more time to make up your mind.